← Opera and teenagers: Why opera? Strauss’ Die Frau ohne Schatten is widely considered to be a connoisseur’s opera. While the music is no more dissonant/”modern” than the more popular Salome or Elektra, Frau requires 5 star singers instead of just 1 or 2, and the story is challenging for even the most creative directors. Despite this, it’s becoming more widely performed, and Opus Arte has released a DVD of the Salzburg production from last summer with an all-star cast. Onto easier topics to discuss: the singing and orchestral playing are all gorgeous. Anne Schwanewilms has often been accused of being a cold, uninvolved actress with a gorgeous voice. 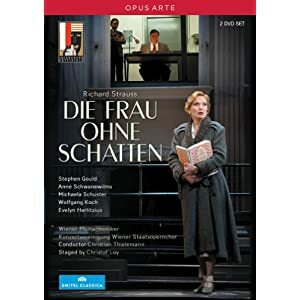 After having seen both this DVD and her Rosenkavalier one, I can see why people would think that, but the cold and aloof characterization is part of both productions. In fact, I find Schwanewilms to be a very talented actress – throughout this performance, she subtly changes her posture, movements, and even her style of singing to enhance the character arc Loy has developed for her. Despite a few hardened top notes, her voice is impressively even and beautiful. The Emperor, played by Stephen Gould, was also impressive in this equally demanding role. This role is perhaps comparable to Bacchus in Ariadne in terms of its high tessitura, so it was a surprise to hear such a baritonal voice in the role. However, Gould sang and acted well throughout the evening, especially at the beginning. Michaeala Schuster was a little over-the-top in terms of her acting, making the Nurse little more than an evil caricature, but her voice is undeniably large and exciting. Wolfgang Koch sings beautifully and elegantly in what can be a barky role, but a little bit at the expense of the character. And the best for last – Evelyn Herlitzius is an amazing Dyer’s Wife. It’s not a very sympathetic character, and it’s easy for the character to end up like a complete shrew. However, Herlitzius is a very good actress and has a nice voice with the appropriate laser-like quality for projection. In the end, Barak and his wife become a very real couple, unlike the Emperor and his wife, and are the emotional centre of the production. This opera is also known for having a rich and thick orchestration, but Thielemann never lets the orchestra completely cover the singers. He still manages to bring out the variations and colours in the score, and there is finer orchestral detail in this recording than many studio recordings. I personally love Strauss’ orchestrations, and so it’s nice to have such detail in good sound. Even though this is an opera I first discovered a few years ago, this is certainly the finest DVD, and one of the finest recordings, of the opera I’ve encountered.